Personalized Articles, Videos, and...Graphic Novels! If you've found your way to this blog you know what Spotlight is all about: turning education data into language and images that anyone can understand and make use of. Data-populated USA Today-style articles for teachers. Automatically-produced infographics for high school students headed for college. Personalized videos for parents -- in their home language. And now, in our aim to reach millenials where they are, we've developed the ability to mass-produce "graphic novels" -- each one starring the student herself. If you're a child of the 70's, you'll remember those personalized books you could send away for: Fill out a form and drop it in the mail, and two weeks later you receive a picture book, starring Big Bird, or Batman, and...you. Your name, your address (creepy! ), your friends' names, maybe even your teacher's -- right there in the book. 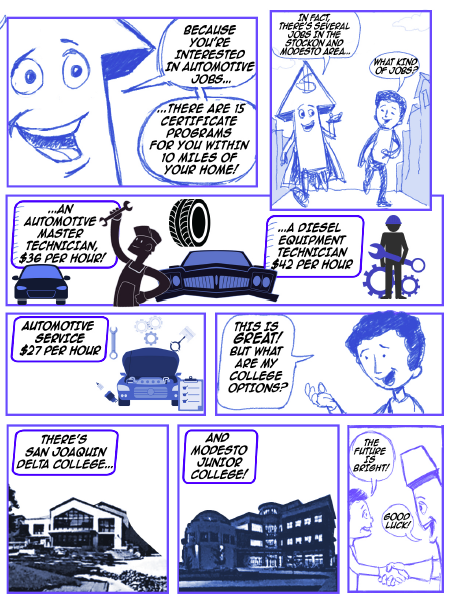 In the 2017 version, Spotlight has created graphic novel-style career readiness reports. Each report considers a student's background, strengths and interests, and uses this data to driven the text and images in a comic-style report. The information is specific, and actionable, and the format is easy to understand and fun to review. Check out a sample below. All in our effort to bring students the agency that they deserve, and that they need to thrive in a rapidly-evolving economy and society. Older PostSeek a Smaller Ratio with us at SXSWEdu!